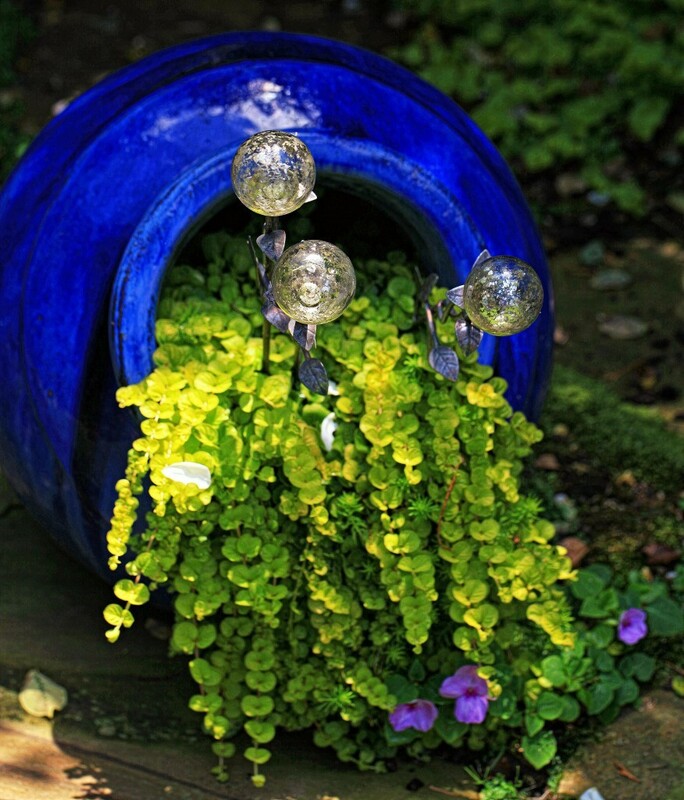 Water features are soothing, but can be expensive to purchase or DIY. So how do you get the appearance of a constantly flowing water feature without the moisture, price tag, or mess? 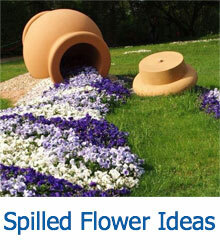 Create a spilling planter! 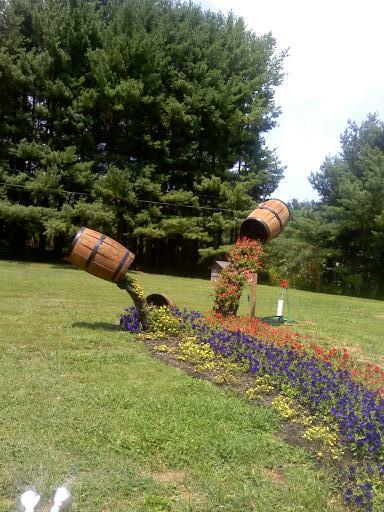 These are decorative garden displays that use flowing patterns or vines to simulate water flowing out of an overturned planter, urn, or other vessel. Some smaller, tabletop displays can feature flowing vines to simulate water spilling over the top or out of the spout. 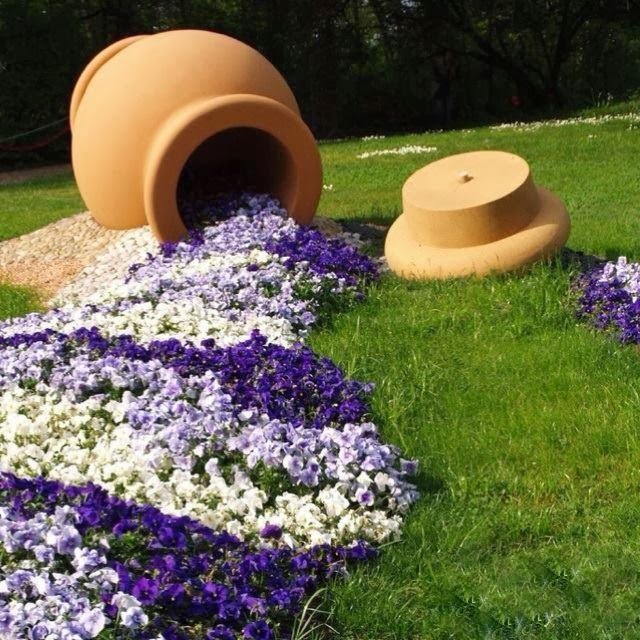 Other larger urns, barrels, or planters can be turned on their side and partially buried in the garden or filled with soil to allow small flowering plants or ground cover to grow. The flowering plants are then planted in an arrangement to simulate a spreading puddle of spilled water or another liquid. 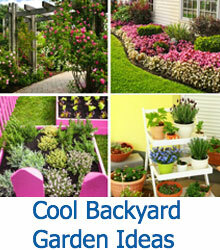 The sky’s the limit when it comes to creating your own spilled flower garden, since you can choose to emulate an existing natural structure, or simply create one straight from your imagination. We’ve found some of the most attractive and creative versions of this decorative trick, and we hope you’ll be inspired to tackle a similar project on your own! This is one of the most simple ways to create a spilling flower pot display, by partially burying a terra cotta planter in a planting bed and then planting small flowers spreading outwards and getting narrower as the display lengthens. Petunias are a great choice for an inexpensive, yet fragrant display. 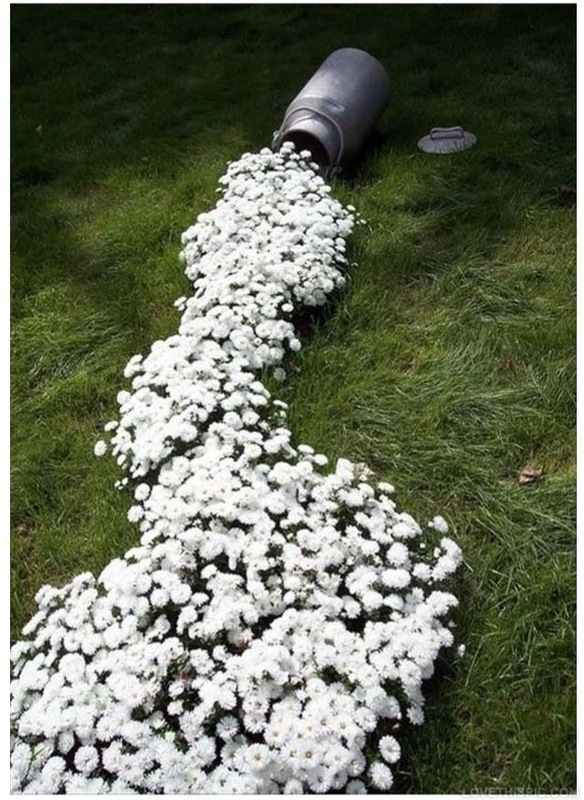 This is a more unique display featuring a vintage milk can with a wealth of small white flowers flowing out of the mouth and out into the yard in a serpentine, widening and narrowing pattern. There’s no reason to cry over this spilled “milk”! 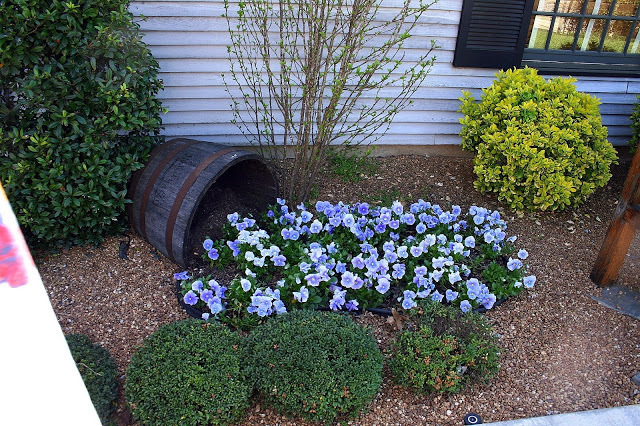 This is a more country style spilled flower display inside of a well-landscaped flower bed. 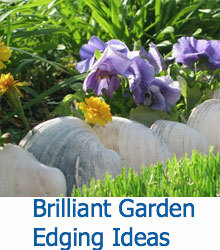 Note that this display uses edging to keep the display of violets nicely in shape. The use of an old barrel brings plenty of style and atmosphere to this simple, yet pretty display. This is a more complex version, featuring a large overturned clay urn secured to the yard with cobblestone. Out of the mouth of the urn, white, lavender, and violet flowers spray out across the yard. The flowers are arranged in bands, somewhat like ripples. This is a seriously impressive version of the spilled planter, with two large barrels suspended from a wire and trails of yellow and red flowers seeming to pour from the mouth. The center line of purple flowers seems to flow out of the mouth of the middle barrel on the ground. The vibrant, thick nature of these blue-purple flowers creates a waterfall effect from the mouth of this decorative, carved urn. The color is absolutely stunning next to the rich red wood chip bed. The wood chips are a perfect addition, since they cover the soil and add to the illusion that the flowers are pouring out of the urn. 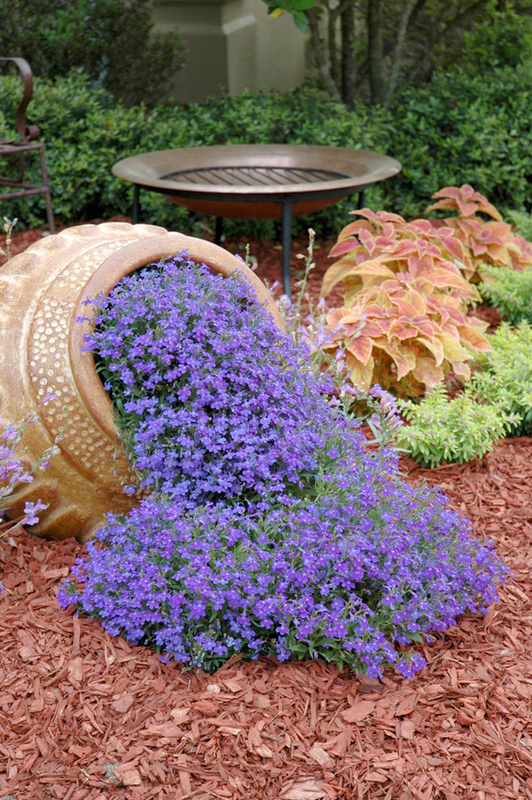 This lightweight bucket has flowers that spill out of it forming a slightly arched “pool” of flowers, resembling a puddle made by a rolling bucket. 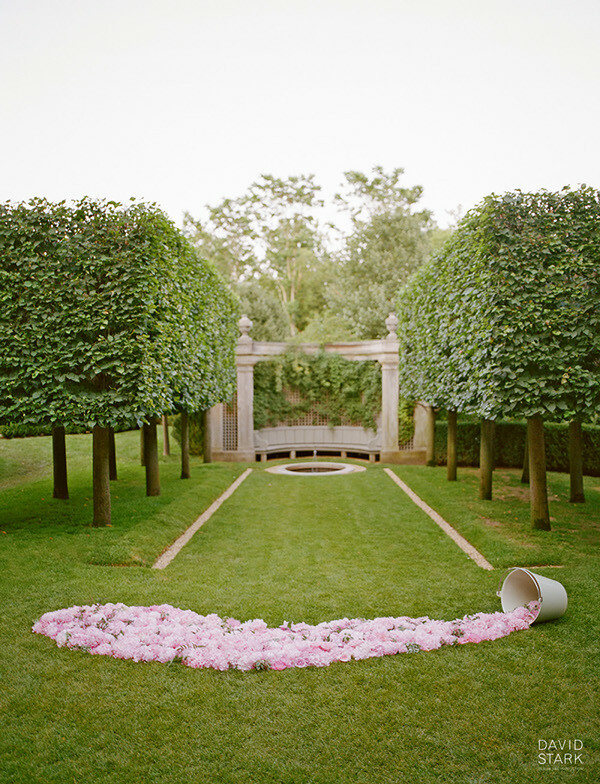 This slightly messy, chaotic display creates a fantastic sense of dichotomy when paired with the perfectly manicured topiary trees, grass, and the asile up to a fire pit and trellis. This tabletop display is one of the more unique versions of the display that we’ve seen, and features a wide variety of succulents, which are low maintenance and come in an insane amount of varieties and shapes. 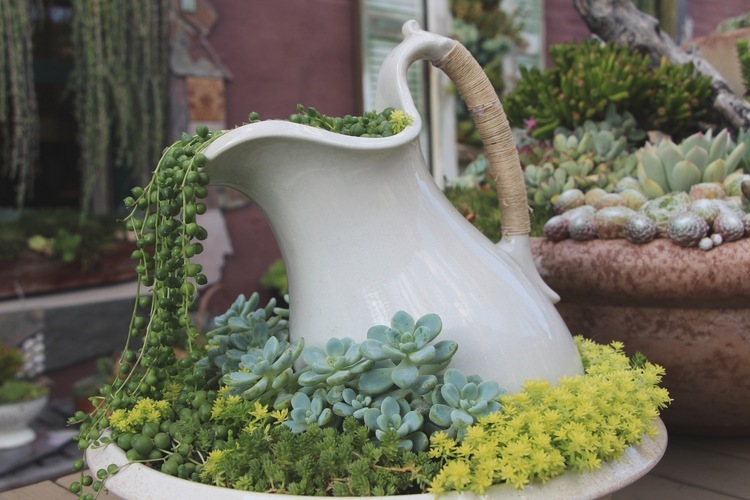 The bottom dish is filled with small succulents, while the pitcher is filled with a more vine-like variety to simulate pouring water. If you choose a more simple plant to display, like these vines or ferns, you may choose to dress up the display by using a bold colored ceramic planter, or add small glass baubles on stakes. These details take the spilled vines to a whole new level. 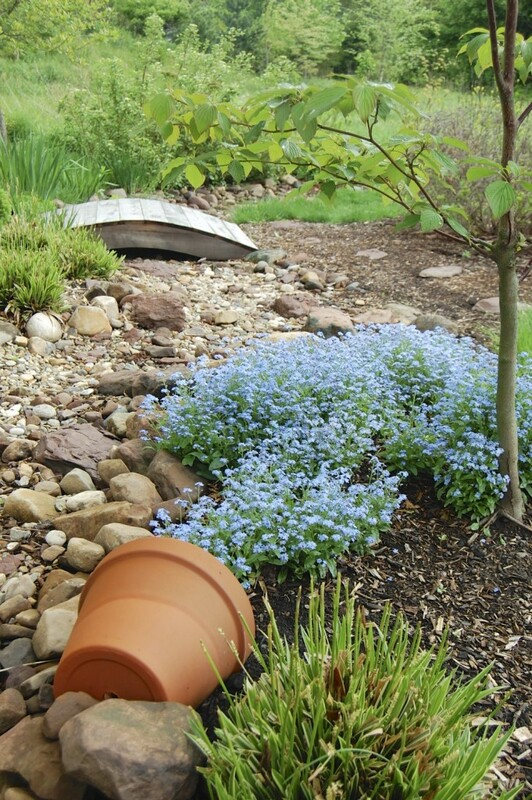 Here we see another simple display featuring a terra cotta pot and a large, flowing array of small light blue flowers. This is a display that takes full advantage of location, placing the flowers next to a dry stream bed and a small footbridge. Absolutely gorgeous!